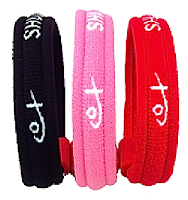 These Shuzi Comfort Bands are one of the more casual styles that can clearly be worn by men or women any age. This particular style gives you a little pop of color and they're more affordable than some of our other bracelets. It still utilizes a proprietary chip made in the U.S., which is programmed to resonate with your cells’ natural frequencies to improve blood circulation. No clasps or buckles. Available in black, pink, and red.